Looks so good! I love Pad thai. Thank you! 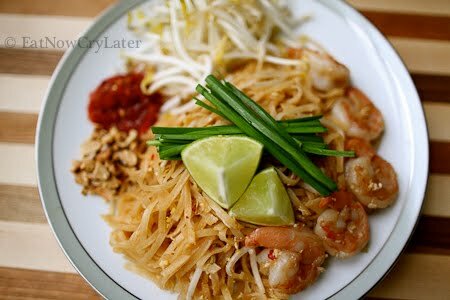 Pad thai is definitely a favorite amongst most people, huh?? I'm so glad I found your recipe on YouTube! Definitely going to try making this soon, it looks delicious! Thanks Ayra! I hope you do try it! So good!! This looks so good, I can't wait to try it. Silly question, why do you only make one batch of sauce at a time? When you double the recipe, you have to cook the sauce for longer and for some reason, it comes out saltier. So, in theory, you may double the recipe but you would have to modify the ingredients. I was really excited to see such an easy pad thai recipe but when I made the sauce the fish sauce smell was seriously bad enough for me to go run to my mama and slap her, which I didn't but no joke that smell was reeaaallll bad O_O! !, I was wondering if the fish sauce smell was suppossed to still have a pretty strong scent in the sauce when it's finished. Did I do something wrong or is it supposed to be like that? Hi there. Sorry for the late response but I've moved blogs, so there's been a delay. The smell shouldn't be too strong once you're done cooking it. When you add it to your noodles during stir frying, the smell will not be strong. Also the type of fish sauce matters. Some are more saltier and smell stronger. I recommend the Three Crabs Brand. Hi Lovely! Here it is: Procedure: Take 1 pound of hard palm sugar and cover completely in COLD WATER. Once the sugar begins to break down slightly(about 15 minutes), remove and drain well in a colander. Place sugar into a microwave safe bowl, and add in 2 tbsp of warm water. Microwave on high for 1-2 minutes. Remove and stir. Place in an air tight, microwaveable container and store in a cool, dry place like a cupboard. Reheat it as often as you need it. If you would like to keep it in a more liquid state...add more water before you microwave. The recipe looked nothing like that. Sorry it didn't work out for you. Maybe you can elaborate, so that we can see what went wrong for you? Hi- why do you have one cup of water listed twice in your sauce recipe? Thanks! Can I half the sauce recipe? Also instead of palm sugar can I use brown sugar, and is it still the same amt? Thank you for the recipe! I also watched your youtube video which was nice. I think making the sauce from scratch is definitely the most challenging part (besides the pungent smell you noted). I personally used a premade pad thai sauce while following most of your recipe and it worked out well. Letting the rice noodle sit in hot water instead of boiling it is key - unlike the normal wheat pasta, rice noodle cooks much more quickly and leaving it firm before stir-frying definitely helps with this dish. On the sauce recipe is it 2 cups of water or 1?